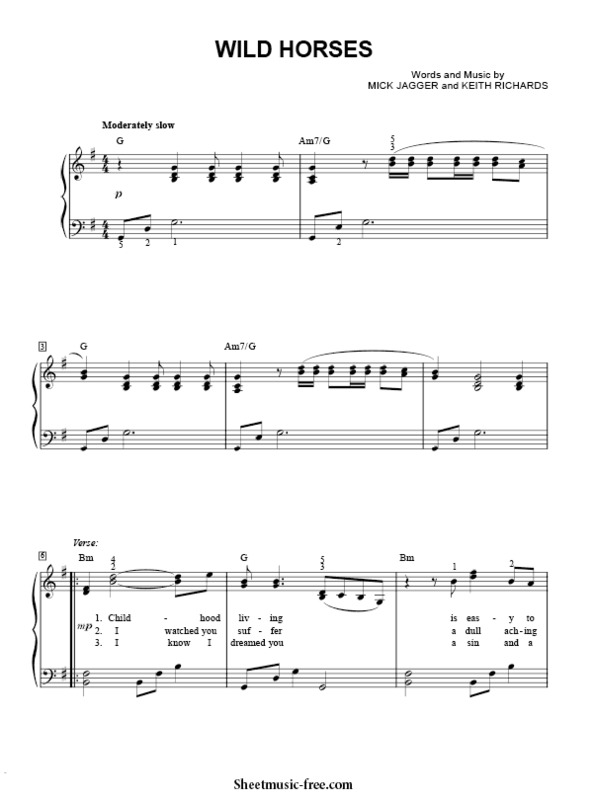 “Wild Horses Sheet Music” by Rolling Stones, “ Wild Horses Sheet Music” for Piano / Vocal/ Chords , Original key: G Major, number of pages sheet music PDF: 3, Video and Lyrics song Wild Horses Sheet Music. “Wild Horses’” is a song by The Rolling Stones from their 1971 album Sticky Fingers, written by Mick Jagger and Keith Richards. Wild Horses Sheet Music Rolling Stones. One year prior to its release on Sticky Fingers, Gram Parsons convinced Jagger and Richards to allow him to record “Wild Horses” with his band The Flying Burrito Brothers. He’d become good friends with Richards and helped with the arrangement of “Country Honk” as it appeared on the album Let It Bleed. The song was included on the album Burrito Deluxe released in April 1970 on A&M Records.